Explore our wonderful world in this fascinating collection of seven non-fiction texts. This Read with Oxford Stage 2 collection is ideal for children who are developing early reading skills. Read with Oxford offers an exciting range of carefully levelled reading books to build yo... read full description below. Find out about exotic plants, explore beautiful beaches and see the world through an animal's eyes. 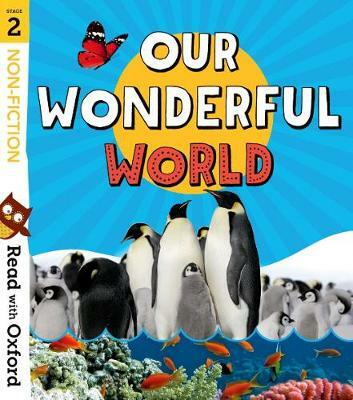 Explore our wonderful world in this fascinating collection of seven Read with Oxford non-fiction texts, ideal for children who are developing early reading skills. This collection includes seven enjoyable non-fiction texts designed to tap into your child's interest and pleasure in the wonderful world around us. Packed full of incredible facts, with full-colour photos and artwork. The texts are phonics-based and have been specially written so that your child can read them for themselves. Tips for parents and fun after-reading activities help you to get the most out of the texts. Featuring much-loved characters, great authors, engaging storylines and fun activities, Read with Oxford offers an exciting range of carefully levelled reading books to build your child's reading confidence. Find practical advice, free eBooks and fun activities to help your child progress on oxfordowl.co.uk. Let's get them flying!